متی, رودی, زندیه, حسن, نامداری منفرد, مصطفی. (1391). کشمکش بین اعراب، ترکان و ایرانیان بر سر بصره (طی سال‌های 1700-1600میلادی). فصلنامه تاریخ روابط خارجی, 13(51), 99-143. رودی متی; حسن زندیه; مصطفی نامداری منفرد. "کشمکش بین اعراب، ترکان و ایرانیان بر سر بصره (طی سال‌های 1700-1600میلادی)". فصلنامه تاریخ روابط خارجی, 13, 51, 1391, 99-143. متی, رودی, زندیه, حسن, نامداری منفرد, مصطفی. (1391). 'کشمکش بین اعراب، ترکان و ایرانیان بر سر بصره (طی سال‌های 1700-1600میلادی)', فصلنامه تاریخ روابط خارجی, 13(51), pp. 99-143. متی, رودی, زندیه, حسن, نامداری منفرد, مصطفی. کشمکش بین اعراب، ترکان و ایرانیان بر سر بصره (طی سال‌های 1700-1600میلادی). فصلنامه تاریخ روابط خارجی, 1391; 13(51): 99-143. بصره ایستاری در راه رسیدن به مکه بود. این شهر نقش محوری در تجارت و سیاست و نیز کشمکش قدرت میان دولت صفویه و امپراطوری عثمانی ایفاء می‌کرد. در سال 917ق./ 1512م. بصره تحت سلطه حکومت مستقل عربی به نام منتفق اداره می‌شد. ظاهراً نخستین بار شاه اسماعیل اول صفوی ادعای تملک بر بصره را داشت، اما هرگز تفوق خود را بر آن نواحی تثبیت نکرد. در سال 1021ق./ 1612م. یکی از سرکرده‌های نیروهای عثمانی با حفظ مقیدات محلی، سلسله مستقلی به نام افراسیاب را بنیان نهاد که تا سال 1080ق. / 1669م. بر بصره حکم می‌راند. دخالت در امور بصره تنها به ایرانیان محدود نمی‌شد؛ هنگامی که افراسیاب پاشا نیروهای والی هویزه را از شهر بصره بیرون کرد، نیروهای صفوی در اواخر سال 1029ق./ 1620م. تحت فرماندهی امام قلی خان به بصره یورش بردند. اما از آنجایی که پرتغالی‌ها از تجارت با بصره سود سرشاری کسب می‌کردند، در صدد دفاع از شهر برآمدند. اقتدار مجدد دولت عثمانی در سال 1080ق. / 1669م. منجر به صلح و آرامش 10 ساله در این ناحیه گردید، با این حال بار دیگر از سال 1090ق. / 1680م. جنگ‌ها با قبایل عرب به ویژه با قبیله منتفق از سرگرفته شد. طی سلطنت شاه سلیمان صفوی تعدادی از والیان بصره به دولت ایران پناهنده شدند و از حاکم صفوی تقاضای کمک نظامی نمودند. اما شاه برای حفظ قرارداد صلح بین دو کشور به هیچ یک از آن‌ها کمک نکرد. سرانجام در دوره شاه سلطان حسین صفوی بود که پادگان ایرانی کلید طلایی دروازه شهر را به فرمانده عثمانی واگذارکرد و نیروهای ایران در سال 1110ق. / 1700م. شهر را ترک کردند. این پژوهش تنها قدرت‌ها و قبایل در دوره مورد بحث را بررسی نمی‌کند، بلکه جامعه بصره و مشکلات آن را از آغاز سده شانزدهم تا پایان سده هفدهم به تصویر خواهد کشید. Al-Huwayzi, Abd ‘Ali b. Nasir (1380/1961), Tarikh al-imara al-Afrasibiya aw halqat mafquda fi ta’rikh al-Basra, Baghdad. Ali Shakir ‘Ali(1983), ‘al-Tanzimat al-idariya al-‘uthmaniya nisf al-thanmin al-qarn as-sadis‘ashar’, Majallat Dirasat al-Khalj wa al-Jazra al-‘Arabiya, Kuwait, 25. ---------------- (1980), Ta’rikh al-‘Iraq‘and al-‘Uthman 1638–1750 m. Dirasa ahwalihi al-siyasiya, Baghdad. Al-Ka‘bi, Al-Shaykh Fath Allah b. ‘Alwan (1377/1958), Zad al-musafir wa lahnat al-muqm wa al-hadir, ed. ‘Ala’ al-Din Fu’ad, second edition, Baghdad. Ambrosio, A. S. Teresia. P. Fr., O.C.D. ( 1938), ‘Relatione della missione di Bassora’, Analecta Ordinis Carmelitarum Discalceatorum, 13. XVIIth and XVIIIth Centuries, 2 vols paginated as one London. ‘Azzawi, ‘Abbas (1372/1953). Iraq bayn al-ihtilalayn, 7 vols, Baghdad. Bacqué-Grammont, Jean-Louis, Rahmé, Viviane and Hamza, Salam (1996), ‘Notes et documents sur le ralliement de la principauté de Basra à l’Empire Ottoman (1534–1538)’, Anatolia Moderna 6. ---------------- (2004) ‘Textes ottomans et safavides sur l’annexion de Bassora en 1546’, Eurasian Studies3/1. Barkan, Ömer L.( 1970) ‘Research of the Ottoman fiscal surveys’, in M. A. Cook (ed. ), Studies in the Economic History of the Middle East ,London. Birken, Andreas, Die Provinzen des osmanischen Reiches (1976) (Beihefte zum Tübinger Atlas des Vorderen Orients, Reihe B, Nr. 13.) Wiesbaden. Boxer, C. R(1930). Commentaries of Ruy Freyre de Andrada, NewYork. Carré, Abbé(1948). The Travels of the Abbé Carré in India and the Near East 1672 to 1674, 3 vols paginated as one ,London. Chardin, Jean (1810–11). Voyages du chevalier Chardin en Perse et en autres lieux de l’Orient, ed L. Langlès, 10 vols and atlas, Paris. Cordeiro, Luciano(1898). Dois capitaes da India. Documentos ineditos entre osquaes diversascentidoes autographas de Diogo de Conte, Lisbon. De Bourges, M (1666). Relation du voyage de monsigneur l’évêque de Beryte... par la Turquie, la Perse, les Indes etc.Paris. De Gouvea, Antonio (1646). Relation des grandes guerres et victoires obtenues par le roy de Perse, trans. A. de Meneses, Rouen. DellaValle, Pietro (1665). The Travels of Sig. Pietro della Valle, a Noble Roman, into East India and Arabia Deserta, London. De Thevenot, Jean (1727). Suite de voyage de Mr. de Thevenot au Levant, vol. 4 of Voyages de Mr. de Thevenot en Europe, Asie et Afrique, third edition, 5 vols. Amsterdam. Dunlop, H(1930). (ed. ), Bronnen tot de geschiedenis der Oostindische Compagnie in Perzië, 1630–38.The Hague. Eskandar Beg Monshi(1978). History of Shah ‘Abbas the Great, ed. and trans. Roger M. Savory,2 vols paginated as one ,Boulder, Co.
Faroqhi, Suraiya(1994).Pilgrims and Sultans:The Hajj under the Ottomans,London. Fitch, Ralph (1905–07). ‘The Voyage of Master Ralph Fitch Merchant of London to Ormus...’, in Samuel Purchas (ed. ), Hakluytus Posthumus or Purchas His Pilgrimes, 20 vols ,Glasgow. Floor ,Willem and Faghfoory, Mohammad H(2004). The First Dutch–Persian CommercialConflict: The Attack on Qeshm Island, 1645, Costa Mesa. Foster, William(1909). The EnglishFactories in India, 1624–29, Oxford. François Valentijn(1727). Oud and nieuw Oost-Indiën, 8 vols in 5 tomes, Dordrecht. Gaudereau, Martin(1979). ‘Relation de la mort de Schah Abbas roi de Perse et du couronnement deSultan Ussain, son fils’, letter 12 Aug. 1694, in Anne Kroell (ed. ), Nouvelles d’Ispahan 1665–1695, Paris. Gollancz, Hermann (ed.) (1927). Chronicle of Events between the Years 1623 and 1733 Relating tothe Settlement of the Order of Carmelites in Mesopotamia, London. Gulbenkian, Roberto (1995). ‘Relações políticoreligiosas entre os Portugueses e os mandeus baixa Mesopotámia e do Cuzistâo ne primeira metade do século XVII’, in idem, Estudios Históricos, II, Relações entre Portugal, Irâo e Médio Oriente, Lisbon. Hamid, Tarik Nafi (1980). ‘The political, administrative and economic history of Basra Province 1534–1638’, (PhD Dissertation, University of Manchester. Hamilton, Alexander(1727). A New Account of the East Indies, 2 vols, Edinburgh. Imber, Colin (1996). ‘The navy of Sülayman the Magnificent’, in Colin Imber, Studies in Ottoman History and Law, Istanbul. Inalcik, H (1970) ‘The Ottoman economic mind and aspects of the Ottoman economy’, in M. A.Cook (ed. ), Studies in the Economic History of the Middle East, London. Iskandar Beg Turkaman(1317/1938). Dhayl-i tarrikh-i ‘arlam-arra-yi ‘Abbasi, ed. Khvarnsari Suhayli ,Tehran. Iskandar Beg Munshi Turkaman (1350/1971), Tarikh-i ‘alam-ara-yi ‘Abbasi, ed. Iraj Afsha r, 2 vols paginated as one, second edition, Tehran. Ja‘fariyan, Rasul (1379/2000). Safaviyah dar ‘arsah-i din, farhang va siyasat, 3 vols paginated as one, Qum. Kasravi Tabrizi, Sayyid Ahmad (1362/1983). Tarikh-i pansadsalah-i Khuzistan,Tehran. Khvajigi Isfaharni, Muhammad Ma‘sum b., Khulasat al-siyar (1368/1989). Tarikh-i ruzgar-i Shah Safi Safavi. Iraj Afshar, Tehran. Le Gouz de la Boullaye (1657; repr.1994), Les voyages et observations du Sieur Boullaye-de-la-Gouz, Paris. Longrigg, Stephen Hemsley (1925; repr. Reading, 2002). Four Centuries of Modern Iraq. Oxford. Mandaville, John E.(1970),‘The Ottoman province of al-Hasa in the sixteenth and seventeenth century’ Journal of the American Oriental Society 90. Martineau, Alfred (ed.) (1931–34), Mémoires de Francois Martin, fondateur de Pondichery (1665–1696), 3 vols, Paris. McChesney, R. D.( 2003).‘The Central Asian Hajj-pilgrimage in the time of the early modern Empires’, in Michel Mazzaoui (ed. ), Safavid Iran and Her Neighbors, Salt Lake City. Masters, Bruce(1988). The Origins of Western Economic Dominance in the Middle East: Mercantilismand the Islamic Economy in Aleppo, 1600–1750, New York. Matthee, Rudi(1998). ‘Iran’s Ottoman diplomacy during theReign of Shah Sulayman I’, in Kambiz Eslami (ed. 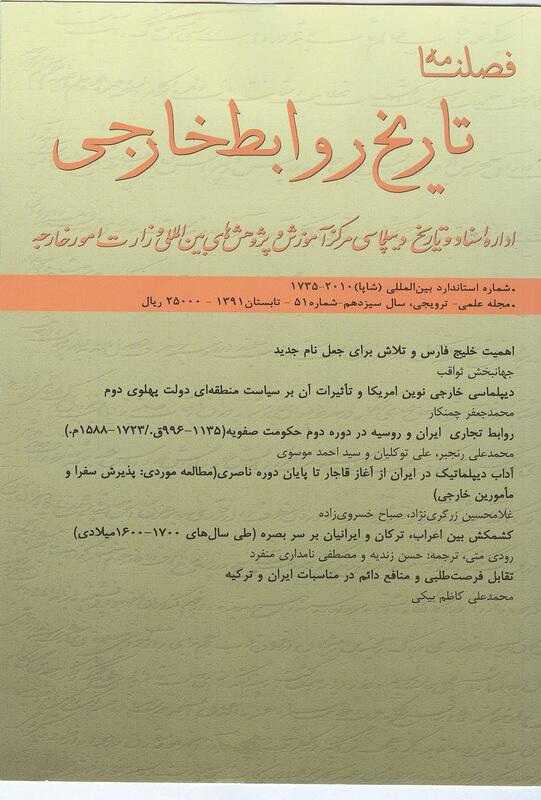 ), Iran and Iranian Studies:Papers in Honor of Iraj Afshar Princeton. -------------, (2003).‘The Safavid–Ottoman frontier: Iraq-i Arabs as seen by the Safavids’,International Journal of Turkish Studies 9. Mulla Kamal(1326/1950).Tarikh-i Mulla Kamal, in Ibrarhim Dihgan (ed. ), Tarikh-i Safaviyan ,Arak. Murphey, Rhoads (1999). Ottoman Warfare1500–1700, New Brunswick. ------------, (2003).‘The resumption of Ottoman–Safavid border conflict, 1603–1638:effects of border destabilization on the evolution of state–tribe relations’, Orientwissenschaftliche Hefte. Mitteilungen des SFB ‘Differenz und Integration’, 5: Militär und Integration, Halle. Nasrabardi, Muhammad Tarhir(1317/1938), Tadhkirah-i Nasrabardi, ed. Vahid Dastgirdi ,Tehran. Nasiri,Muhammad Ibrarhim b. Zayn al-‘Abidin(1373/1994). Dastur-i shahriyarrarn, ed. Muhammad Nardir Narsiri Muqaddam ,Tehran. Pamuk, Sevket (1999). A Monetary History of the Ottoman Empire, Cambridge. Qazvini ,Abu’l Hasan b. Ibrahim(1367/1988). Fava’id al-safaviyah, ed. Maryam Mir Ahmadi ,Tehran. Qazvini, Muhammad Tahir Vahid (1329/1950). ‘Abbasnarmah ya sharh -i zindigani-yi 22 salah Shah ‘Abbars-i thani(1052–1073), ed. Ibrahim Dihqan ,Arak. Qazvini Isfahani, Muhammad Yusuf Valah(1380/2001). Khuld-i barin. Iran dar zamarn-i Shah Safi va Shah‘Abbas-i divvum (1038–1071 h.q. ), ed. Muhammad Riza Nasiri ,Tehran. Ranjbar, Muhammad ‘Ali (1382/2003).Musha‘sha‘iyan. Mahiyat-i fikri-ijtima‘i va fararyand-i tahavullart-i tarikhi, Tehran. Raphaël du Mans, Francis Richard (1995) ,missionnaire enPerse au XVIIe s., 2 vols ,Paris. Rizk Khoury, Dina (1991), ‘Merchants and trade in Early Modern Iraq’, New Perspectives on Turkey5–6. Slot, B. J (1993). The Arabs of the Gulf 1602–1784, Leidschendam. Soucek, Svat (1984). ‘Arabistan or Khuzistan’, Iranian Studies 17. Stewart, Devin (1989). ‘The humor of the scholars: the autobiography of Ni‘mat Allah al-Jazar ’iri(d. 1112/1701)’, Iranian Studies 22. Teixeira, Pedro (1902). The Travels of Pedro Teixeira, trans. and annotated William F. Sinclair, London. Thabit A. J. Abdullah (2001). Merchants, Mamluks, and Murder: The Political Economy of Trade in Eighteenth-Century Basra, Albany. Vincenzo Maria di S. Caterina da Siena(1672). Il viaggio all’Indie orientali,Venice. von Oppenheim, Max Freiherr (1952). Die Beduinen, vol. 3, Werner Caskel, Die Beduinenstämme im Nord- und Mittelarabien und im ‘Irark, Wiesbaden. Carmelite Archive, OCD 241a, F. Angelo dell’Annunziata, Basra. Dutch National Archives, The Hague (NA), Coll. Geleynssen de Jongh 280e, Mathys van Riethoorn, Basra Daghregister (Diary), 8 Oct. 1646, unfold. NA, VOC.1188,1208, Elias Boudaen, Basra Daghregister, fols. NA, VOC. 1152,1255, Van Riethoorn, Basra Daghregister, fols. NA, VOC 1251, Brouwer, Basra to Van Wyck, Gamron, fol. NA, VOC 1425, Van Bullestraten, Basra to Heren XVII, 26 Sept. 1687, fol. NA, VOC 1279, De Haeze, Gamron to Heren XVII, 14 Oct. 1672, fol. NA, VOC 1355,1507,1571,1582, Verdonck, Basra to Heren XVII, fols. NA, VOC 1603, 1611, 1614, 1626.1699, Hoogcamer, Gamron to Batavia, fol. NA, VOC 1373, Van den Heuvel, Gamron to Batavia, fols.